A KC-46A Pegasus refueling tanker from the 418th Flight Test Squadron connects with an F-35 Lightning II from the 461st Flight Test Squadron Jan. 22 during a test sortie over California. It is the first time the new aerial tanker connected with a fifth-generation fighter. 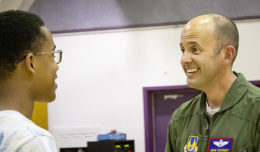 The 418th FLTS mat Edwards Air Force Base, Calif., is overseeing Phase III testing of the Pegasus, which is a 15-month period where the Air Force will certify fleet aircraft to refuel or be refueled by the KC-46. The squadron’s continued testing on the KC-46A Pegasus program informed the decision for the Air Force officially accepting the next generation tanker Jan. 10, marking a major milestone for the program and allowing Airmen to begin operational testing and flight training. 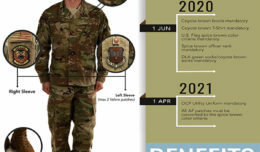 The KC-46A is intended to start replacing the Air Force’s aging tanker fleet, which has been refueling aircraft for more than 50 years. 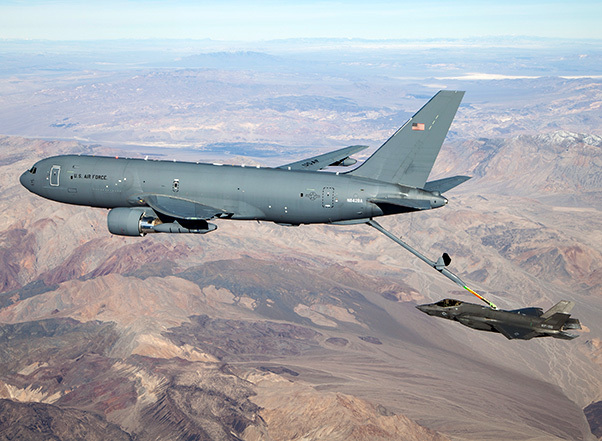 With more refueling capacity and enhanced capabilities, improved efficiency and increased capabilities for cargo and aeromedical evacuation, the KC-46A will provide aerial refueling support to the Air Force, Navy, Marine Corps as well as allied nation aircraft.